It happened in the beginnig of the year 1971: "The winner hit the line!" The semiconductor manufacturer MOSTEK presented the first single-chip calculator. As it is shown on the internal picture, a lot of parapherna- lia is needed to complete the calculator. 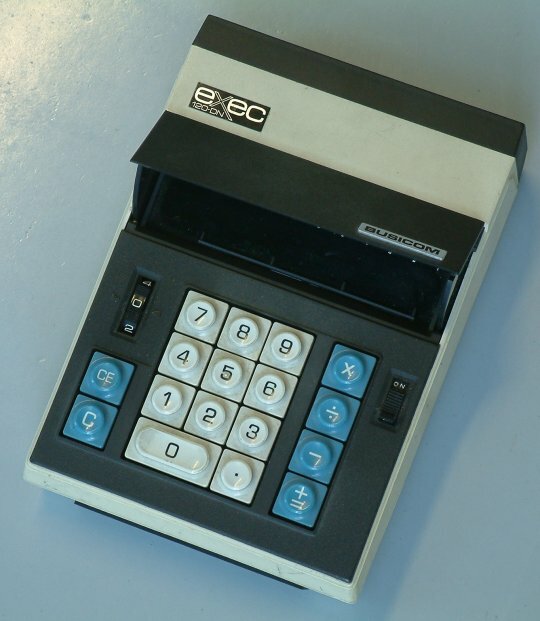 This calculator was not the first, which was equipped with the MK 6010. Before, Busicom built the little bigger Busicom Junior, which contained two boards with together 22 ICs. In the middle of the run both boards were replaced by only one, which was designed in the way that nothing had to be changed: neither at the keyboard, nor at power supply nor at the display.